Untitled DocumentShane Cannon's Art from Achill Island, County Mayo. I hope you enjoy viewing my work and If any other aspects of my practice interests you feel free to contact me. Thank you for visiting and enjoy. Download PDF of Gallery 2. Shane Cannon gives presentation at "Ignite the West" event. The gallery contains a selection of my current visual project. The work illustrated consists of images captured from fluid Images in acrylic while still wet and fully alive. The prints I made from these images are archival Giclée prints produced to the highest standards with pigmented inks on special archival paper. The prints are in editions of 25 and are signed by me. Enter Gallery 2 This is a PDF File of recent Acrylics on Board. This gallery of images was exhibited for a large group of international visitors in February this year. Here is an interview recorded at the end of the evening. Ágnes Dús from Budapest interviews Shane Cannon about his work. Acknowledged in May 2008 with an Honors Fine Art Degree, Shane Cannon's work now reflects the unique experience that life on Achill Island and life in general provides for him. Shane's insights into life have many facades for those who know him well. Never short of commentary on current affairs his fellow students during his academic years in art college will recall his engaging ways with the topics of the time, globalisation, artistic expression, social issues, public art, and his passion for surfing. His emerging and succinct perspectives as a postgraduate are reflected strongly in his work. Shane's art is modern, aggressive, non apologetic. It is at times a medium to give, and at other times it confronts and questions. His imagery is universal. It can be interpreted at both a conscious and subliminal level. A subjective interpretation can take the viewer on a journey which is personal while the energy and colour of his pieces capture the imagination. Shane Cannon's determined journey into this life of expression through art started somewhere in his second level education. His quiet and confident pursuit of artistic expression became his goal. Shane's life could be described as being dedicated to being open to new possibilities and challenges. His life on Achill Island has served him as it has many other writers and artists to form his approach to living and his ability to give expression through his art. Shane Cannon's current work celebrates the enthusiasm of a young emerging west of Ireland artist. He possesses a strong sense of identity. His work is unforgettable for it's richness and what it represents. Admirers of his work have said it is a tribute to the energy of the modern young and informed mind. 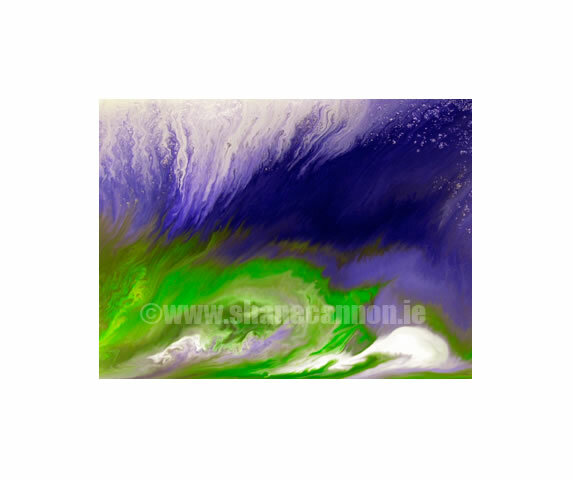 Shane Cannon's work can be viewed at The Western Light Art Gallery, Keel, Achill Island, Co. Mayo. I am seeking interactive commissions from the private and public sectors involving the application of my natural attributes and artistic training. Aspects of the relationships between the world of business, charitable organisations and public bodies frequently needs fresh approaches. My training together with my interest and research into globalisation, public art and social issues have equipped me to facilitate in many situations. I am always interested in giving motivational talks to groups of any kind. Invitations to explore possible proposals are welcome. I am interested in developing intercultural projects. I would welcome opportunities to develop concepts as public art projects. All contacts, referrals and proposals are welcome for discussion. When you visit Achill call to The Western Light Art Gallery in Keel. The Western Light Art Gallery, The Sandybanks, Keel, Achill Island, Co. Mayo. An image is a gift for life.